The Lampasas River (segment 1217 in the Brazos River Basin), rises in western Hamilton County 16 miles west of Hamilton and flows southeast for 75 miles, passing through Lampasas, Burnet, and Bell counties. In Bell County the river turns northeast and is dammed five miles southwest of Belton to form Stillhouse Hollow Lake (segment 1216). Below Stillhouse Hollow Lake, the Lampasas River flows to its confluence with Salado Creek and the Leon River to form the Little River. 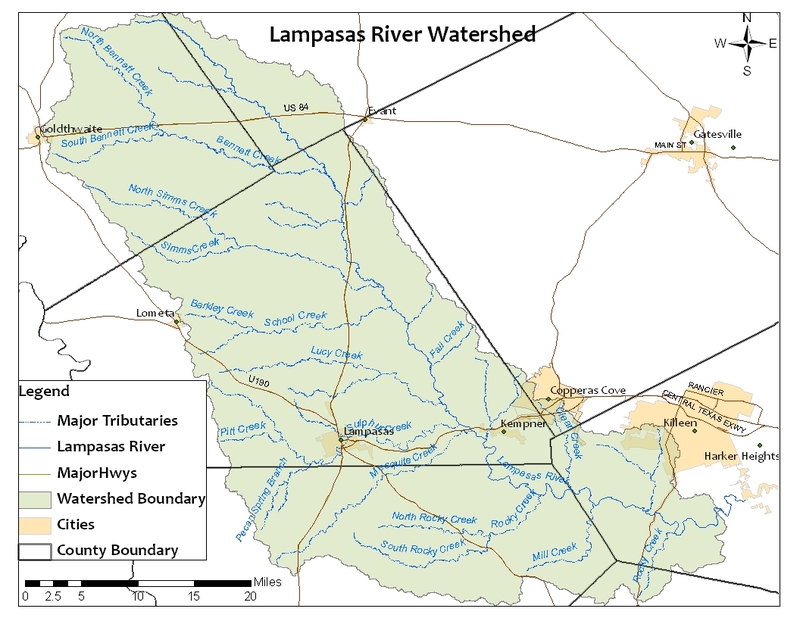 The Lampasas River is characterized by relatively low water levels most of the time and is situated within a predominantly rural and agricultural landscape. Land use within the watershed is mostly rural, with grasslands and row crops. Major agricultural interests include beef cattle on rangeland, in addition to hay, wheat, oats, sorghum, corn, cotton, peanut, and pecan operations. Texas requires that water quality in the Lampasas River be suitable for contact recreation and a healthy aquatic ecosystem. This "swimmable and fishable" goal is not fully supported. The Lampasas River above Stillhouse Hollow Lake is listed as impaired on the Texas Water Quality Inventory and 303(d) List due to elevated bacteria levels. Surface water quality monitoring also indicates a dissolved oxygen concern on North Fork Rocky Creek. In addition, population growth and rapid urbanization occurring in the lower portion of the watershed further stress the need to protect the chemical, physical, and biological integrity of the river. Funding and support for this effort are provided through a Clean Water Act §319(h) Nonpoint Source Grant from the Texas State Soil and Water Conservation Board and the U.S. Environmental Protection Agency.